Tonsillitis is inflammation of the palatine tonsils as a result of either a bacterial or viral infection. The palatine tonsils are a concentration of lymphoid tissue within the oropharynx. Tonsillitis will often occur in conjunction with inflammation of other areas of the mouth, giving rise to the terms tonsillopharyngitis (the pharynx is also involved), and adenotonsillitis (the adenoids are also involved). The size of the tonsils in relation to the oropharynx changes with growth and development. At birth the tonsils are fairly small; between the ages of 4 and 8, the tonsils are at their largest (1). Bearing this in mind, large clearly visible tonsils are not always the result of infection (see below under clinical features). It is important to note that a significant proportion of infections of the upper respiratory tract, including tonsillitis and pharyngitis, are viral in origin (2, 3). Risk scores and indicative symptoms exist to help determine the difference between bacterial and viral causes (see below under clinical features). Common viral causes are Adenovirus and Epstein Barr Virus, whilst Group A Streptococcus (Strep. Pyogenes) is the commonest bacterial organism, accounting for between 15 and 30% of cases depending on the study/age of child (4, 5). Smoking – either second hand smoke from parents or personal smoking in older children significantly increases the risk of tonsillitis (6). The exact duration of symptoms varies depending on the causative organ, but in general will last between 5 and 7 days. Symptoms lasting longer than 7 days may be due to glandular fever. Antibiotics will most likely benefit a patient when their sore throat is caused by streptococcal bacteria. Two clinical scoring tools that can help to identify those in whom this is more likely are ‘Centor criteria’ and ‘FeverPAIN criteria’. Clinical practice can vary on which, if any, tool is used. A score of 3 or more is highly suggestive of bacterial infection (40-60% likelihood) and a score of 2 or less suggests bacterial infection is unlikely (80% likelihood) (2). Each element gives 1 point up to a maximum of 5. Score 0-1 suggests a 13-18% chance of streptococcal infection, 2-3 is 34-40% chance and 4-5 is 62-65% chance (2). 5 criteria = 59% chance of GAS, 6 criteria = 75% (7). The grading system for tonsillitis. 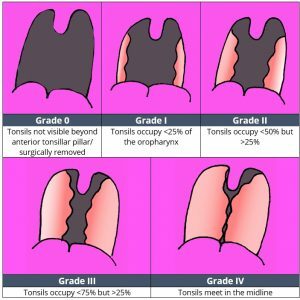 It is worth noting that grade II and III tonsils are at peak incidence at 4-5 years old. 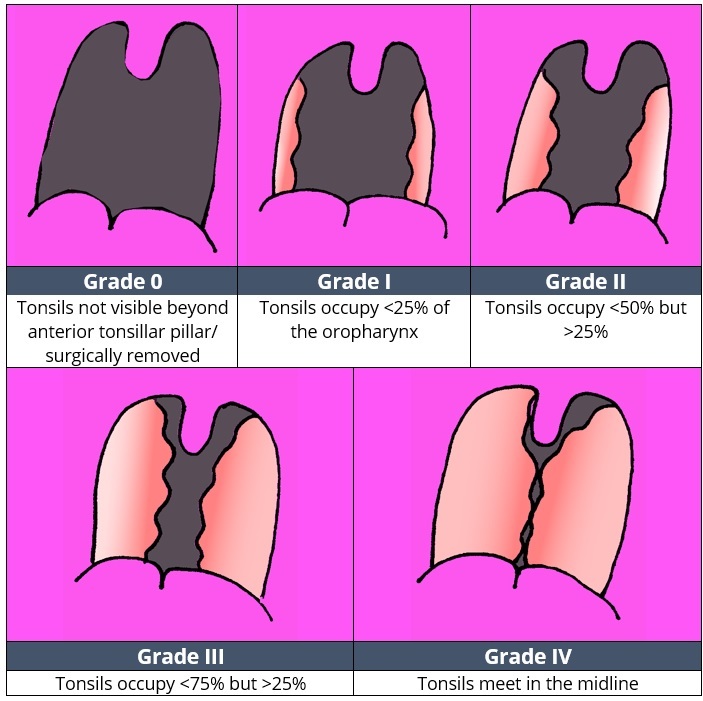 Until the age of 6, grade II tonsils predominate compared to grade I (1). Enlargement of the tonsils in isolation is not necessarily a sign of infection, particularly in children with known recurrent episodes of tonsillitis. Bilaterally enlarged, somewhat rough, and irregular tonsils may represent the scarring and changes induced by recurrent infection. The general consensus is that throat swabs are of limited value. They cannot differentiate between infective organism and colonisation (9, 2). Also, in the time it takes for a result to be made available, the child has usually either been successfully treated or the symptoms have resolved. The first key decision is whether the patient requires inpatient admission or not. The pointers below are merely guidelines and should not replace clinical judgement. Patients who fulfill the centor criteria should be given antibiotics to cover Group A Streptococci. Typically, this will be a penicillin, usually Benzylpenicillin, dosed according to the child’s weight. Route depends on the degree of odynophagia (9) (10). Although penicillins are the most common agent used in the UK, there is evidence to suggest that effectiveness of penicillin in providing complete resolution is diminishing and that cephalosporins may in fact be more effective (11). Co-amoxiclav is often avoided in cases of tonsillitis due to the small risk of permanent skin rash if the tonsillitis is due to glandular fever. Paracetamol and Ibuprofen are effective pain relief in tonsillitis and can be alternated in order to give effective pain relief. Topical analgesia, such as difflam (benzydramine) spray/mouthwash, can be helpful to reduce pain and allow the child to swallow oral analgesic agents. Steroid therapy is frequently used in children and adults with tonsillitis. A Cochrane review in 2012 concluded that resolution of pain at 24 hours was three times more likely following steroid administration (12). Although IV and IM steroids are often used in adults, the research in children mainly relates to oral steroids (13). A meta-analysis in 2012 advocated the use of 0.6mg/kg oral dexamethasone (up to 10mg) as a single one-off dose for pharyngitis – this was found to be particularly effective in exudative or Group A Strep. positive disease (14). Tonsillectomy is reserved for patients with recurrent, troublesome tonsillitis. The SIGN criteria are generally used to determine whether tonsillectomy is appropriate (15). PSGM is overwhelmingly more common in children (usually ages 6-8). Interestingly, certain strains of GAS are more likely to cause glomerulonephritis and certain strains are more likely to cause rheumatic fever (16). PSGM has an incidence of around 1.7 per 100,000 and the classic triad of symptoms is hypertension, haematuria and oedema. There is also often proteinuria, but without true nephrotic syndrome. Acute rheumatic fever (ARF) is now thankfully rare in developed nations (<1 per 100,000 in the US) but still poses a particular threat to paediatric populations in developing nations, most noticeably due to rheumatic heart disease. ARF is an autoimmune response to GAS which typically affects children aged 5-14. It develops 2-5 weeks after the initial infection and causes a variety of symptoms including; prolonged fever, anaemia, arthritis, and pancarditis (17). (1) A. Ackay, C. Kara and M. Zencir, “Variation in tonsil size in 4-to 17-year-old schoolchildren,” Journal of Otolaryngology, vol. 35, no. 4, pp. 270-274, 2006. (2) NICE, “Sore throat (acute),” NICE, Jan 2018. [Online]. Available: https://www.nice.org.uk/guidance/ng84/chapter/terms-used-in-the-guideline . (3) A. Putto, “Febrile Exudative Tonsillitis: Viral or Streptococcal?,” Paediatrics, vol. 80, no. 1, 1987. (4) J. Windfuhr, N. Toepfner, G. Steffen, F. Waldfahrer and R. Berner, “Clinical practice guideline: tonsillitis I. Diagnostics and nonsurgical management,” European Archives of Oto-Rhino-Laryngology, vol. 273, no. 4, pp. 973-987, 2016. (5) C. I. Timon, V. McAllister, M. Walsh and M. Cafferkey, “Changes in tonsillar bacteriology of recurrent acute tonsillitis: 1980 vs. 1989,” Respiratory medicine, vol. 84, no. 5, pp. 395-400, 1990. (6) A. E. Hinton, R. C. D. Herdman, D. Martin-Hirsch and S. R. Saeed, “Parental cigarette smoking and tonsillectomy in children,” Clinical Otolaryngology, vol. 18, no. 3, pp. 178-180, 1993. (7) E. Wald, M. Green and B. K. Schwartz B, “A streptococcal score card revisited,” Pediatric Emergency Care, vol. 14, no. 2, pp. 109-111, 1998. (8) A. Guimaraes, G. Carvalho, C. Correa and R. Gusmao, “Association between unilateral tonsillar enlargement and lymphoma in children: A systematic review and meta-analysis,” Oncology Haematology, vol. 93, no. 3, pp. 304-311, 2015. (9) K. Stelter, “Tonsillitis and sore throat in children,” GMS Current topics in Otorhinolaryngology – Head and Neck Surgery, vol. 13, 2014. (10) V. Visvanathan and P. Nix, “National UK survey of antibiotics prescribed for acute tonsillitis and peritonsillar abscess,” The Journal of laryngology and otology, vol. 124, no. 4, pp. 420-423, 2010. (11) J. Caser and M. Pichichero, “Meta-analysis of cephalosporin versus penicillin treatment of group A streptococcal tonsillopharyngitis in children.,” Pediatrics, vol. 113, no. 4, pp. 866-882, 2004. (12) G. Hayward, M. Thompson, R. Perera, P. Glasziou, C. Del Mar and C. Heneghan, “Corticosteroids as standalone or add-on treatment for sore throat.,” Cochrane Database Systematic Review, vol. 17, no. 10, 2012. (13) K. Korb, M. Scherer and J. Chenot, “Steroids as Adjuvant Therapy for Acute Pharyngitis in Ambulatory Patients: A Systematic Review,” Annals of family medicine, vol. 8, no. 1, pp. 58-63, 2010. (14) S. Schams and R. Goldman, “Steroids as adjuvant treatment of sore throat in acute bacterial pharyngitis,” Canadian family physician, vol. 58, no. 1, pp. 52-54, January 2012. (15) SIGN, Management of Sore throat and indication for tonsillectomy, SIGN, 2010. (16) T. Eison, B. Ault, D. Jones, R. Chesney and R. Wyatt, “Post-streptococcal acute glomerulonephritis in children:,” Pediatric Nephrology, vol. 26, pp. 165-180, 2010. (17) J. Lee, S. Naguwa, G. Cheema and E. Gershwin, “Acute rheumatic fever and its consequences: A persistent threat to developing nations in the 21st century,” Autoimmunity reviews, vol. 9, no. 2, pp. 117-123, 2009. (18) R. J. Gaffey, D. J. Freeman, M. A. Walsh and M. T. Cafferkey, “Differences in tonsil core bacteriology in adults and children: a prospective study of 262 patients,” Respiratory medicine, vol. 85, no. 5, pp. 383-388, 1991. (19) A. L. Bisno, “Acute Pharyngitis,” The New England Journal of Medicine, vol. 344, pp. 205-211, 2001. (20) R. M. DeDio, T. L. W. C and M. LK, “Microbiology of the Tonsils and Adenoids in a Pediatric Population,” JAMA otoloaryngology – Head and Neck Surgery, vol. 114, no. 7, pp. 763-765, 1988. (21) M. S. Israel, “The Viral flora of enlarged tonsils and adenoids,” The Journal of Pathology, vol. 84, no. 1, pp. 169-176, 1962. (22) P. J and W. JA, “An evidence-based review of peritonsillar abscess,” vol. 37, no. 2, pp. 136-145. Tonsillitis is inflammation of which tonsils? What is the Centor criteria designed to distinguish between? 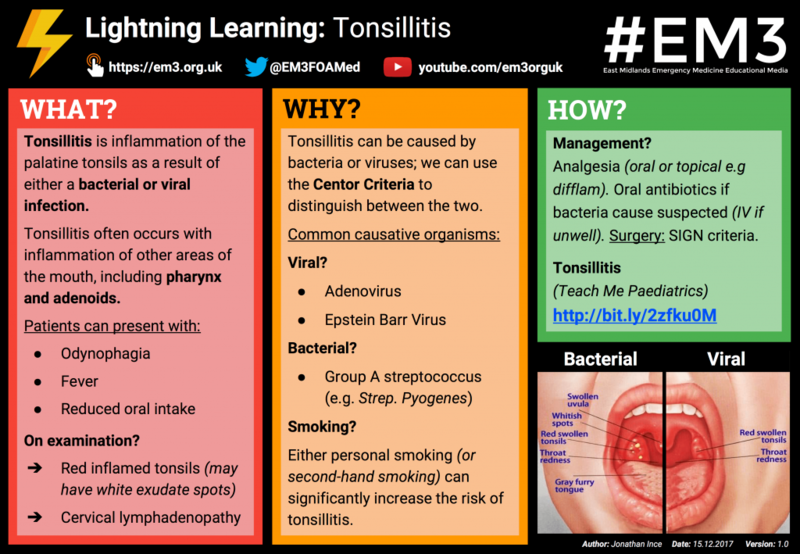 A complication of tonsillitis is quinsy - this is due to a spread of infection into which space? Generally, at what age are the tonsils at their largest? At birth Between ages 1-2 Between ages 4-8 Over the age of 11. Which of the following is not part of the usual triad of symptoms in post streptococcal glomerulonephritis?